Council newcomer talks changes, priorities shortly after taking office, including her relationship with Wheeler. 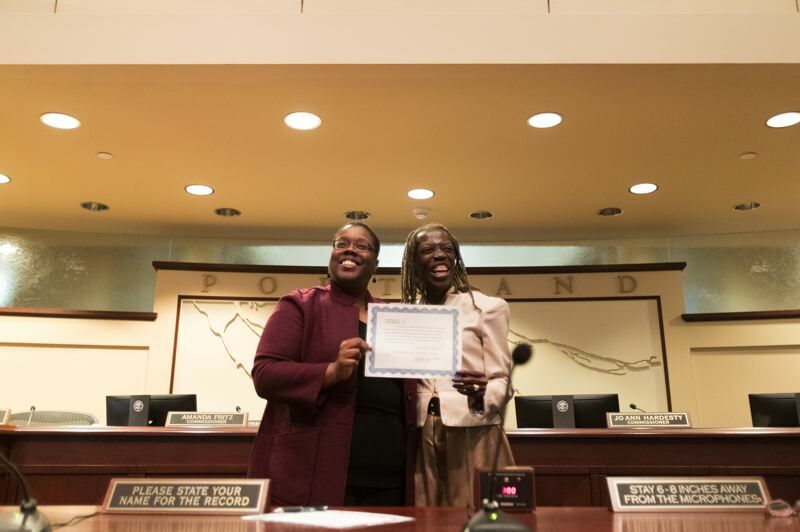 After the historic ascension last week of Jo Ann Hardesty to become the first African-American woman to sit on the Portland City Council, she wasted no time in laying out her plans for what the next four years will look like. 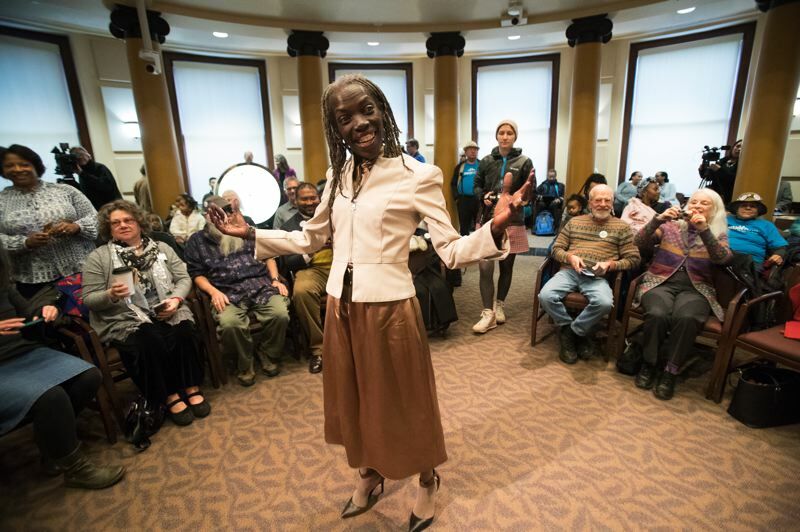 In a wide-ranging Jan. 2 press conference that she dubbed a "meet and greet," Hardesty confirmed what political observers already knew: the newest city commissioner will speak her mind with ease. "Just rolls off the tongue, doesn't it?" she interjected when a reporter called her commissioner. Her meeting with the press showed that there will be surprises, too. That's significant in light of the curiosity her victory has sparked among City Hall watchers about how Hardesty, long a rhetorical bomb-thrower, will mesh with the rest of the council. It appears that, in at least two ways, she will follow in the footsteps of the man she replaces — mild-mannered, pro-business Dan Saltzman. One way is her goal of remaking 911 responses to be more efficient and effective, by changing which first-responders get sent to calls, long a Saltzman focus. That commonality also extends into how council meetings work. In an exit interview in November, Saltzman complained that the frequent disruptions by critics of police and city leaders at Portland council meetings result in fewer people commenting and attending, out of fear. Hardesty voiced that identical concern — even though some of those disrupting have been her allies and warmly supported her. "If that happens every week, then what it does is drown out regular people who finally have the nerve to come down to City Hall and speak their piece," she said. "Nobody's going to come back if every time they come it looks like a fight's about to break out." Another takeaway: she intends to be tactical in pursuing her agenda, such as looking to boost the budgets of the bureaus she directly oversees — Portland Fire & Rescue, the Bureau of Emergency Services and the Bureau of Emergency Communications — at the expense of the Portland Police Bureau, the agency she's often criticized. "I will have an impact on the police without ever having to mention the police, just by working on the rest of that public safety system," Hardesty said. Similarly, she has hired staff with legal and financial expertise in order to take aim at issues that are either citywide or have nothing to do with the bureaus she's been assigned by Mayor Ted Wheeler. "I have an office that won't stay in the box we've been assigned to," she said. What follows are some other excerpts of her meet-and-greet, edited for clarity and brevity. • On Hardesty taking office: "It's a big deal. You have to wonder, after 100 years of governance, to never have had an African-American woman and the last African-American male leaving 24 years ago. It is a really big deal." • Her plans to embed mental health professionals in the 911 center: "It gives me an opportunity to take a critical look at, really, how do first responders respond, and who are the appropriate first responders for various situations? For people with mental health issues, today if you call 911 you could possibly get a police officer, a fire truck with lots of people on it and an ambulance. So we're sending three different first responders for an issue none of them may be appropriate first responders for." • On city spending: "We're following the money ... to see whether or not the money is actually going to whatever we say we want it to go to, and then quite frankly being able to divert money to (other) things we say we want." • On improvements to disaster preparedness in low-income and immigrant communities: "As someone who lived through the California earthquake, the big one, I know that if the community is prepared to look out for each other, we have much better outcomes than if we wait for the public safety forces to show up." • On Mayor Ted Wheeler: "I am sure that there will be areas that we will disagree on, because we have disagreed on those areas for years. But we have many more areas in common than we have disagreement. And so we will work cooperatively on areas that we agree on and I will look for other votes on areas that we disagree on. ... He has to find three votes for his agenda, and I need to find three for mine. And sometimes he'll be successful, and most of the time I hope I'll be successful." • On the city's settlement with the United States Department of Justice that sought to change police bureau policies and oversight in ways that were sometimes unsuccessful: "It was a horribly bad experiment. It did not work. We have wasted tens of millions of dollars. We only have one year left. I just want it to go away, and for us to start to create something different that will have real accountability built into it."